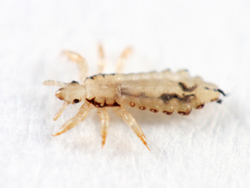 When you or your children have head lice, it can be an absolute nightmare to get rid of. You do everything you can to take care of the immediate problem – the head lice – and then realize that you still have to worry about that lice that are living in your home. When you’ve exhausted your cleaning and delousing abilities but still haven’t rid your home of lice for good, call in the insect pest control experts at Eco Tech. We’ve been serving as Minneapolis exterminators for years, helping residents just like you with insect pest infestations. Although lice are extremely difficult insects to catch, kill, and keep out of your home, and although it probably seems impossible to ever gain the upper hand against lice, it’s not. With Eco Tech, you can eliminate your lice problem completely by treating more than your head for lice. If you haven’t followed the steps to get rid of head lice already, this should be your first step in the delousing process. Because lice will continue to live in your home if they’re living on your head, it’s important to take care of your head lice first before moving on to delousing your home. Once you’ve used the over the counter medications, shampoos and body washes, or any other delousing products or head lice treatments, move on to cleaning beds and pillows, clothing and hats, carpets, furniture, toys, and even your curtains. You’d be surprised how many surfaces in your home are perfect living spaces for lice, and if you stop once you’ve treated the head lice, you can bet that the lice living in your home will cause a return of head lice. Once you’ve rid your home and your head of lice to the best of your ability, the next step is calling in a Minneapolis lice exterminator to finish the lice off completely. There are nooks and crannies in your home that cannot be cleaned thoroughly without the proper lice pest control treatments, and that’s where Eco Tech comes in. As dedicated insect pest removal experts, we’ve made it a priority to ensure that we have the best insect pest control technology and products as well as the most effective pest removal techniques. That means that when you call Eco Tech exterminators, you’re getting live removal experts that know where to find lice and how to eliminate lice from your home. We’ll help you with your final stage of the delousing process, ensuring that once you’ve cleaned your head and your home, we’ve got you covered with our natural pest control treatments to completely drive away any remaining lice. Our organic pest control products are made to be less toxic than traditional home treatments, which means that you and your family won’t have to worry about staying away from your home while we delouse the property. With the help of our Minneapolis, MN exterminators, you can finally rid your home of lice for good with our natural pest control treatments and expert lice removal services. Call us at 763-785-1414, 612-237-8282, 952-881-6662, or 651-633-8600, or for 24-hour emergency service, call (763) 232-7296.